Dallas is in the process of rolling out a “bike-share” system. According to the Dallas Morning News, the city installed the first two stations in a local park this week. The project got a boost from a $125,000 grant, and the plan is to expand the system piece by piece. But due to its pricing scheme and location, this type of bike share shouldn’t be confused with large-scale systems in DC and New York, or even in Cincinnati. Patrick Kennedy writes in his column for D Magazine that Dallas’s new system is more like bike rental. The fundamental [requirements] of bike share to be a success: 1) It’s in places of need — where people live and where they work 2) It gets people out of cars — meaning a healthier, energy and spatial efficient way to travel and 3) it is membership based. Making money is rarely a concern because the positive externalities are worth it. It is seen as an investment in transportation (for a decimal point for what the Trinity Toll Road is to cost) and increasingly it is seen as a necessary investment to attract college grads (at which Dallas is struggling). The Dallas bike share system doesn’t do any of that. It’s for visitors to Fair Park to ride around a bit. And for that, it’s a great asset, but as Paul Sims pointed out on Twitter that is bike rental. Not bike share. It is not transportation, but recreation. So we should call it that. The ambiguity could hurt the effort to scale the system up citywide. What hurts the potential expansion of the system more is its pricing structure, which is rental-based rather than sharing-based. The Dallas system prices the first half hour the most, at $5 for 30 minutes. Then $2.50 each additional 30, punishing ridership while encouraging longer usage of the bike. 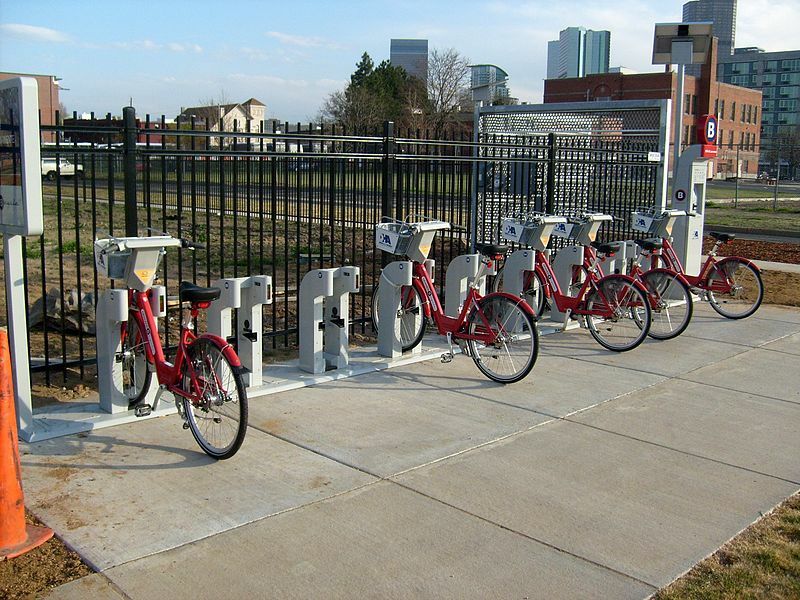 Successful bike share systems are membership-based. A typical member might sign-up for the service and pay an annual fee of say $79/year. Then, when they take out a bike, the first 30 minutes are typically free. This encourages people to sign-up and use the bikes (good thing), but then the rental pricing begins to kick in after that 30 minutes (because keeping the bikes out too long and unavailable for others to use is a bad thing to be discouraged through pricing).When I first heard of this $125,000 bike share system, I tried to reach out to those organizing it to suggest they put the money into the pool for a larger bike share system that would serve the entire city. There was more interest in doing something than doing it well. Unfortunately, that seems to be Dallas’ modus operandi. Cleveland is another city that went this route. A few private individuals recently launched a system with a few stations in a single neighborhood using Zagster, a company that sets up bike programs for corporate and college campuses. Nonprofit groups have since sought to expand the Cleveland system to two additional neighborhoods. Meanwhile the city of Cleveland recently completed a feasibility study that concluded a substantial system would work there. Hopefully the presence of a small, private system won’t muddle plans for a larger municipal bike-share program. Elsewhere on the Network today: ATL Urbanist walks the length of Atlanta’s most popular bus route to evaluate conditions for pedestrians. Streets.mn says cities shouldn’t pursue transportation projects they can’t pay for. And The Political Environment reports that Wisconsin Governor Scott Walker is continuing his anti-urban assaults on Milwaukee. would you expect anything different from a non-Austin Texas city?? Yes. Houston, for instance, had bike share before Austin. It also has invested in 3 very useful light rail lines (a fourth is being held up by an obstinate US Congressman) and will soon have a reasonably complete grid of bus routes running at 15 minute intervals. Austin is falling behind. If anything id say places with severe bikelash who want to start a bike share should call it a bike rental instead. Standard bike share systems are just self-service rental, but we are probably stuck with ambiguous lingo that makes it hard to distinguish service types. The first bike share systems I ever knew of were free to hop on–literal bike sharing. I remember being confused to hear people refer to pay-per-use bike rental in Paris as bike sharing. Now, my distinction has to come from the “system” or “network” designation & details, as it does with sizing up the viability of transit options like buses & trains. Most decision makers won’t be aware of the differences between share and rental that Patrick Kennedy cites. Fort Worth and San Antonio also have B-Cycle, in addition to Austin and Houston. One could probably tell the difference between a transportation designed system that is meant for the broader community vs. a system designed for tourists and their destinations. Its too bad Dallas would not support both. I’m currently in a brainstorming session looking at a broader based system for a small community, Los Alamos, so any thoughts on how small a city can support such a system would be useful. I have not found systems in cities much smaller than 100k folks, i.e., like Boulder, CO. I did find a report on the viability of the U of TN system at Knoxville, link below. Although I agree there is a difference between bike share and bike rental, I don’t think “bike share” is an appropriate word for systems like these. Sharing is mainly peer-to-peer in my opinion. These bikes are provided by the government (which is awesome!) but different than my thoughts on peer-to-peer sharing. In Austin we have this new bike share app on your phone called SPOKEFLY that let’s you check out people’s unused bikes. https://www.spokefly.com/rent-a-bike-in-austin People who lend the bikes make money every time the bikes are used. And you can park wherever. Pretty nifty. I am happy to see more “bike share” programs out there nonetheless!! Will Seattle’s Helmet Law Be a Drag on Its New Bike-Share System? Safe users, clear public spaces, equal access: cities should demand them all from bike share companies.